My daughter had flown the nest for college; my 16-year-old son would fly in two years as well. Our relationship had settled into one of roommates, living on opposite ends of the house, conversations reduced to grunts and “Hey, hon,” as we passed in the hall—a prequel to the impending empty home this single mom feared. My house was old, my dog was old, and I was getting older and lamenting all the things I didn’t do with my children, my life; the dreams abandoned along with the freedom of my youth; and the demise of spontaneity that came with growing up, having a family, and becoming a single mom. Meals were mostly bland mac and cheese; worries, as natural as brushing my teeth. An issue of National Geographic changed everything. I don’t read National Geographic. I don’t have the time. But in my dentist’s waiting room while dreading the repair of a broken crown, I spotted the yellow-trimmed magazine emblazoned with the word Happiness on its cover. It referred to an article about the three happiest places on earth: Singapore, Denmark, and Costa Rica. The previous summer, I’d learned how to surf in an attempt to reconnect with my son. And although it temporarily grew our grunt exchanges to five minutes of dialogue about surfboards and weather conditions, my bad back and creaky hips would keep me on the light side of the ocean, my son three beaches over in the big waves. We were as separate in the sea as we were on land. Costa Rica: one of the top surf destinations in the world, a happy place. In a mere second, a seed of my younger self, the impetuous girl who took risks and dealt with the fallout later, grew into a full-blown idea. With two phone calls and three emails, I sold my unsuccessful engagement ring and bought two tickets to Costa Rica. Yes, it was crazy. It was ludicrous as a single mom. But it was well worth the risk. And as a Solo Mom, it was one of the best decisions I’ve ever made. My spontaneity didn’t leave much choice in hotels, and we grabbed the last room available. Please, oh please, oh please don’t be a honeymoon hotel. Emergency passports, overpacking, and total confusion about the tiny beach town where we’d stay. Google provided little information. Maps were scarce at best. A five-hour flight, two-hour drive, and one more on the world’s bumpiest dirt road and we were there: Nosara, Costa Rica. It was a honeymoon hotel. We didn’t care. Wandering the hotel grounds were iguanas, exotic birds, little skittish crabs, and the famous howler monkeys. A baby lizard in our room was a welcome guest; the frantic bat was not—though it did provide one of the trip’s best laughs. We established our daily routine on day one: A dusty tuk-tuk ride to town (tuk tuks are motorized rickshaws and the most popular form of transport in the largely car-free town) and a walk to the local surf shop. We’d pick up our boards for the day, and I’d pick up my quintessential, movie-star surf instructor. After a short, hot-on-the-feet walk to the beach and a push into the 82-degree water, we were off—no wet suit needed, my cellulite shame fading as my legs grew tan and confident. 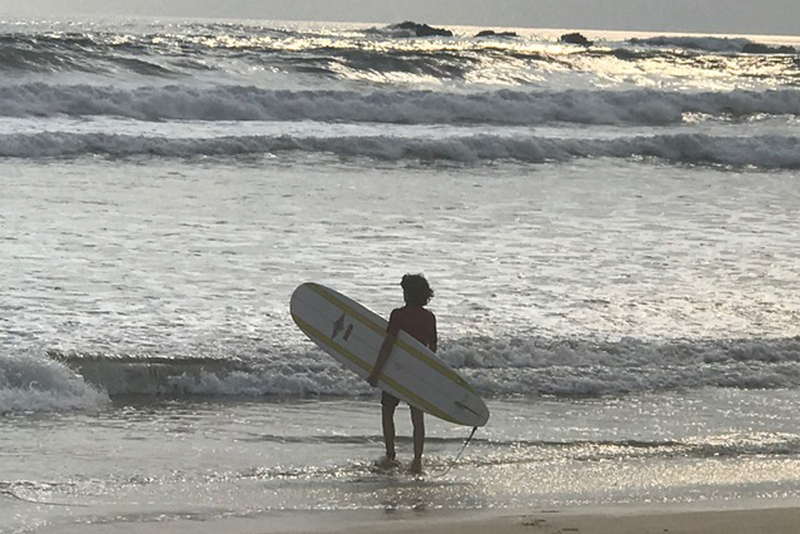 I’d surf the treacherous white wash “on the inside,” my son in the big waves “on the outside.” I was terrified—not for myself, but for my baby boy, beyond my reach, riding huge cliffs of water on a resin-covered piece of Styrofoam. I let him go—my faith in him growing his admiration for me because I let him go. A to-die-for latté and this-is-heaven fresh-fruit smoothie was followed by a 10:00 a.m. lunch with plenty of hot sauce. A wet and sandy journey back to the hotel was followed by an outdoor rinse. Then it was nap time. It was sipping tropical drinks from coconut-rimmed glasses, and rest . . . oceans of rest. This was followed by a return trip to the beach where the entire town converged on the sand to listen to music, socialize, and watch the big boys ride the sunset surf. I knew my son was out there, somewhere, just one of several dots on the horizon. There was no way I could save him. I was here on the shore, alone, beginning the inevitable pull-away trust I needed in my young man. He emerged from the water ecstatic. I gave him his first beer. Drinking on the beach is allowed in Nosara as the locals’ love of their town always left it litter free and sparkling in the mornings. He was shocked and delighted by my breaking of the rules. There would be no more beer, but if my son was to have his first one, I wanted to be the one to give it to him. We’d watch the sun set into its wondrous world of color. Then it was a beyond-belief dinner at one of the town’s handful of restaurants and back to the hotel. The first night I couldn’t move. My muscles throbbed, and my neck was so stiff the glands swelled to rocks. I passed out, sans Ambien, while my son read a book. He read a book! His cell phone as asleep as I. The next day we did it all again—then again for six more days, never at a loss for conversation, never at a loss for laughter. One spitfire argument was followed by negotiations, apologies, and a brownie with ice cream. Our departure was met with silence (on his part), tears (on mine), and mutual vows that we’d return. We didn’t know when. We didn’t know how we’d pay for it. But we’d find a way. After all, we were a team. Weeks later, I wonder if Costa Rica was real or just a magical dream. But my son is making me a surfboard, the grunts have been replaced by conversation, and there is hot sauce on everything . . . even the mac and cheese. Have you done something spontaneous and inspiring? We’d love to hear about it!